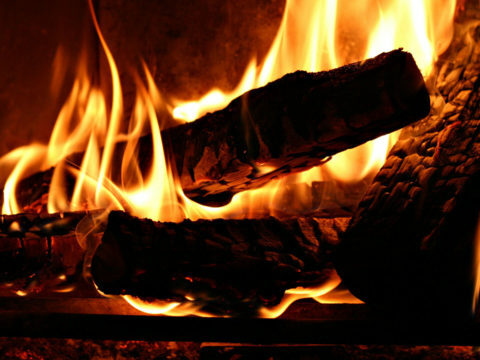 Merryweathers is an independent chartered surveyor and estate agent, established in 1832 and with offices across South Yorkshire. They offer an extensive range of property services, including residential and commercial sales and lettings, auctions, mortgage advice, surveys, and land and agricultural purchases. 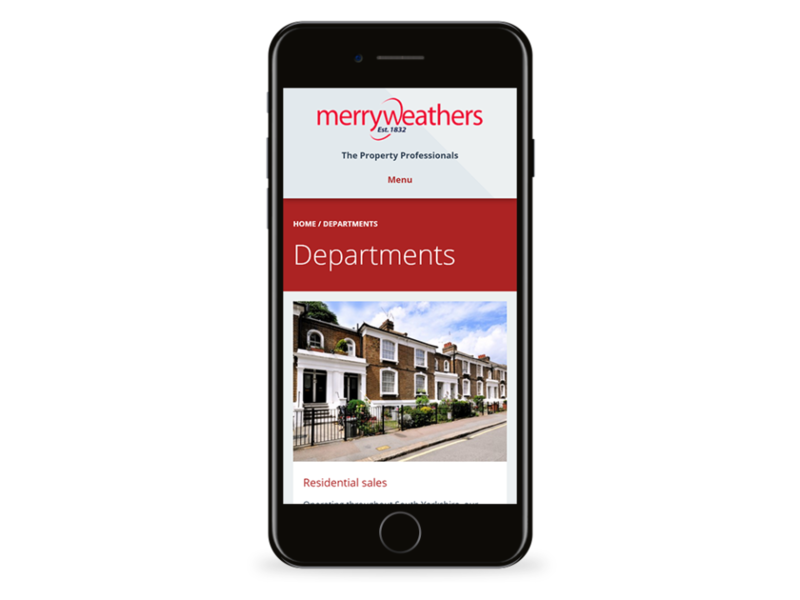 We worked with Merryweathers to design and build a new website, bringing their already successful business to a wider online audience. 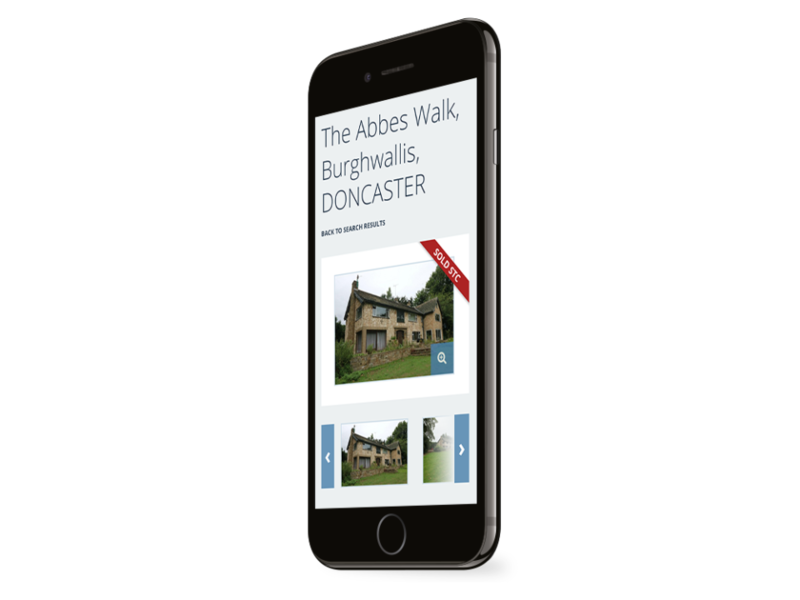 For their customers, the site offers an improved property search and an attractive and accessible interface that works on all devices. 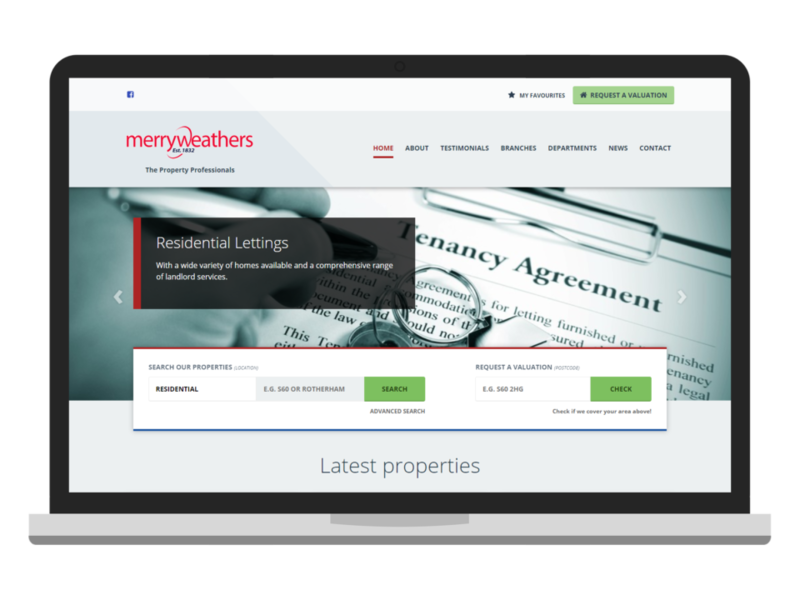 For Merryweathers, it allows quicker and easier content management and tight integration with their existing property database. 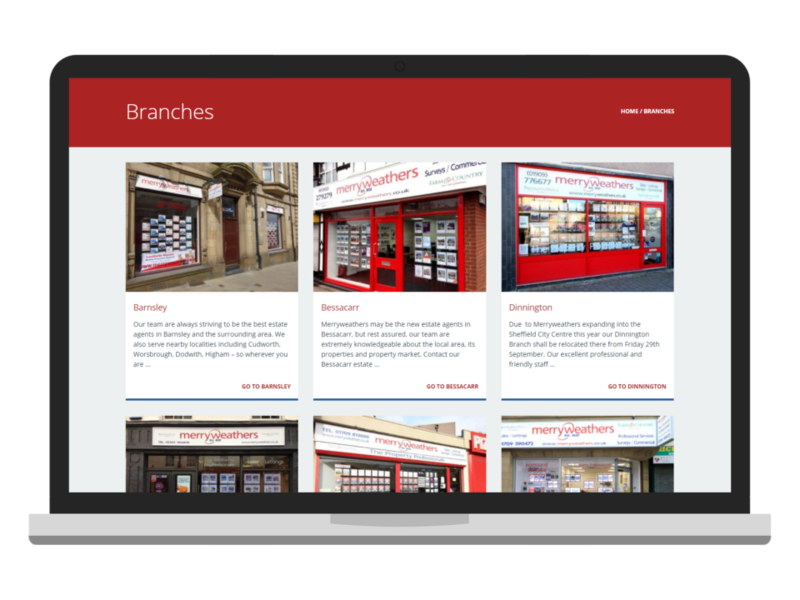 Merryweathers is an established Yorkshire brand, so we took their existing identity and designed a new, modern site that uses their well known logo, colours, and imagery. 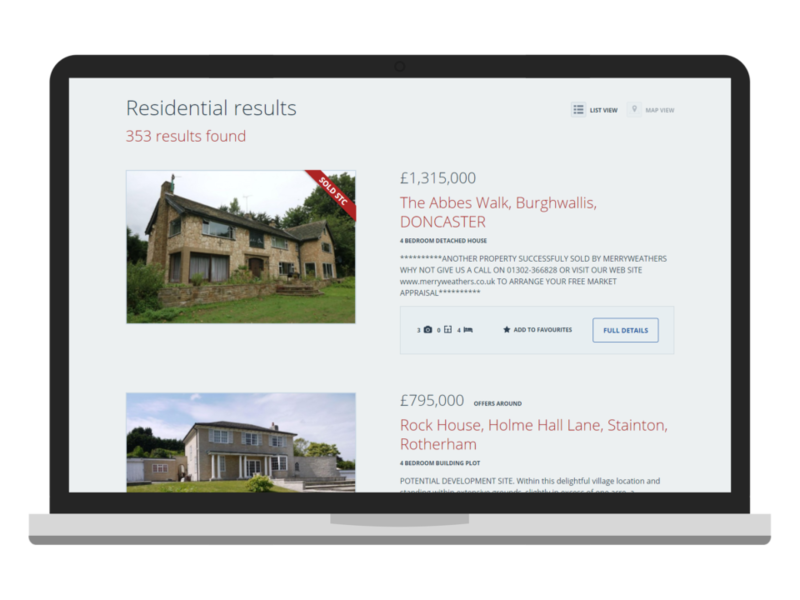 We devised a refined site structure, making it easier to navigate, whether you are looking for a property, a branch, company news, or something else. The redesign was also an opportunity to introduce some new features. For example, the new design incorporates a postcode-based “do we cover your area?” feature. Property listings now include a stamp duty calculator. And users can now highlight particular “favourite” properties that they can come back and view again later. New customers, frequent sales, and an ever changing market mean that Merryweathers staff have to be able to update the site quickly and easily on a daily basis. The properties are imported from DezRez, a specialist estate agency software package. The site itself uses WordPress as a platform for managing content, news, images, and media. Integration with DezRez means that we can provide an accurate and up-to-date property search directly from the website. Users can search by type and location right from the home page and advanced filters are available for the number of bedrooms and minimum and maximum prices. Each property has its own page on the site, with a detailed description, gallery of images, EPC, floorplans, and map. Users can add properties to a list of favourites, a stamp duty calculator gives you idea of the additional cost based on the listed price, and you can request a viewing at the click of a button. We designed and built a new, attractive, modern, and entirely unique website for Merryweathers. We used responsive web design to make sure it works well on mobiles, tablets, and desktop computers. It is accessible and adds various novel, useful features that make it stand out from the competition. For Merryweathers customers, the site is now easier to find, and easier to use. WordPress content management and tight integration with DezRez property management software mean that the site is now much easier to maintain and update. This means Merryweathers staff can spend less time working on the website and more time focusing on their business.